Mike’s HARDER is sending one lucky fan and a guest to the Deadpool 2 Premiere in May 2018 with the Mike’s HARDER Deadpool 2 Sweepstakes. Visit mikesharder.com/deadpool2 now and register for the Sweepstakes for a chance to win. Who Can Enter? 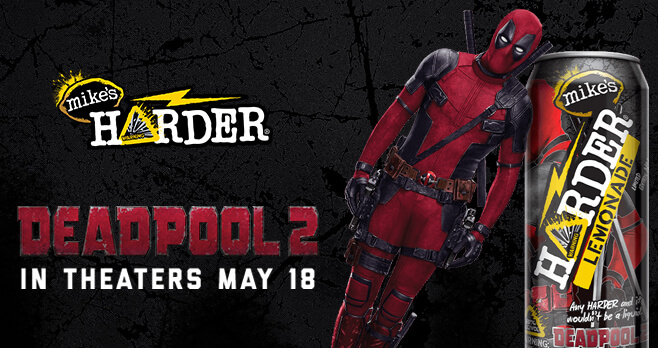 The Mike’s HARDER Deadpool 2 Sweepstakes is only open only to legal residents of the United States and the District of Columbia who are 21 years of age or older at the time of entry. When To Enter? Sweepstakes begins at 12:00:01 a.m. ET on April 1, 2018 and ends at 11:59:59 p.m. (ET) on June 15, 2018. What Is The Sweepstakes Prize? The Grand Prize consists of a trip for two to attend the Deadpool 2 Premiere in May 2018.
good movie the drink is great too.